Chalet Sauterelle offers luxury accommodation for a group of friends, or two families, in four bedrooms, sharing three bathrooms. Sauterelle is situated in Morzine which is fully connected to the huge Portes du Soleil ski region. With over 650km piste and virtually endless off piste there really is something for every grade of skier or boarder to tackle. For the non-skier there are many walks in the area, and lots of shops and restaurants to while away the time. 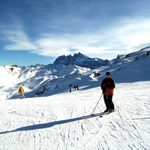 New for the 2009/10 season is a 7 person hot tub situated to take advantage of the stunning views over Morzine. The chalet has two spacious living areas. A large open plan lounge, set around a wood burning fire, with dining area and kitchen plus a further sitting area on the huge mezzanine with a flat screen TV, DVD player and UK TV. The master bedroom is en-suite and has a luxurious king sized bed. Three further bedrooms two twin and one twin/triple share two bathrooms. All of the bedrooms lead onto balconies or terraces and of course all have amazing views of the town and the Pleney slopes. Under the chalet, there is covered parking and a heated ski room. This is for the exclusive use of the chalet and is lockable. After spending many ski holidays in cramped accommodation, we have designed Chalet Sauterelle to be a spacious, contemporary, home from home. The views are truly stunning, day and night, ensuring our guests have a truly memorable stay whatever time of year they visit.